I thought I'd try to write up a quick report on last Monday's New York Film Critics Circle awards. Note: I had just bought a new (& cheap) camera the day before so this was only my second time using it. The setup was not great; it's apparently gotten worse every year. There were barricades set up on the side of the street where the event was being held and a few on across the street where we stood. The cars would pull in to the barricaded area and let the guests out where they then had the option to call us over and we'd be basically have to stand in the middle of the street when they stopped or they could just go right to the door. So there was that. We all ended up hanging out across the street, waiting for someone to show up. 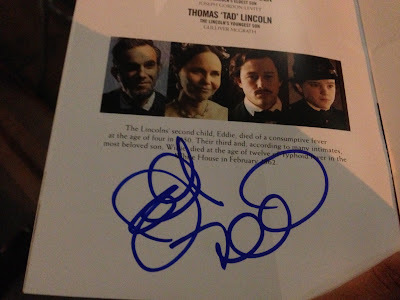 The first to stop and sign was Tony Kushner who had won the NYFCC award for Best Screenplay for Lincoln. I got him on my Lincoln screening program. Not long after a few more people arrive, it's a bit difficult to tell who is who in the dark and from across the street but the photographers yelling their names sometimes helps. Michael Shannon, James Gandolfini and a few others arrive. A few of us are watching the other door as well, hoping to catch Daniel Day-Lewis. Meanwhile, Matthew McConaughey arrives and begins to sign and take pictures. For everyone. I'm too distracted at this point because two of my favourites' car pulls up. Rachel Weisz ends up being the only one in the SUV but I'm still giddy. She stops for photographers but the noise from them and McConaughey still signing, plus the car blocking the view, she heads right in after. I barely even see her. Sad. I miss out on McConaughey. He literally signed for as many people as possible and heads inside. Up next is Sally Field. We call for her and she looks around, "Am I allowed to?" And walks over to us before anyone in her group answers. 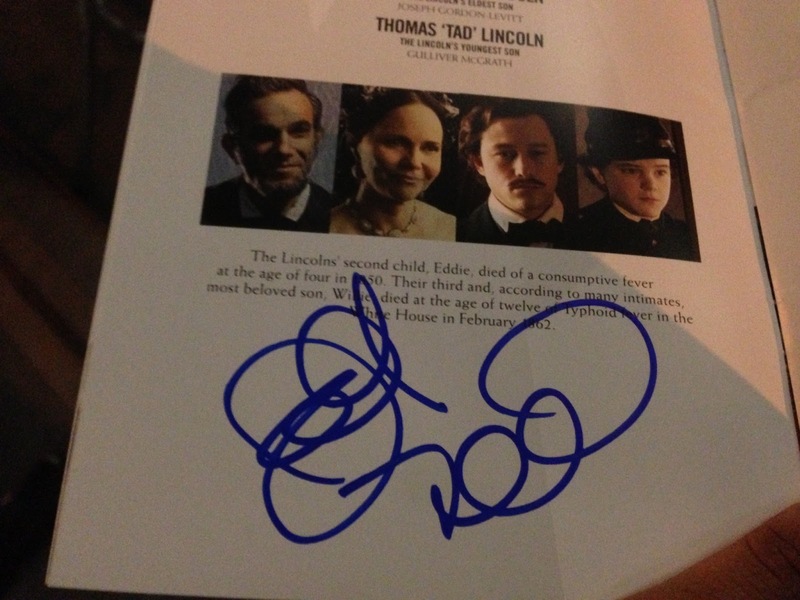 I have her sign my Lincoln program too! She rushes down the line, signing quickly. A couple people asked for pictures and she happily stopped for them. It hits 7 and the ceremony is scheduled to begin. Another car pulls up and out comes...Chris Rock. He seems just as surprised to see us as we are to see him. He heads inside as he is a bit late. Shortly after, Jessica Chastain arrives! I have grown to absolutely adore her even more than previous after seeing her on Broadway in The Heiress. She gladly signs, even as security tells her she's running late. Her publicist even waves him off saying she doesn't mind. 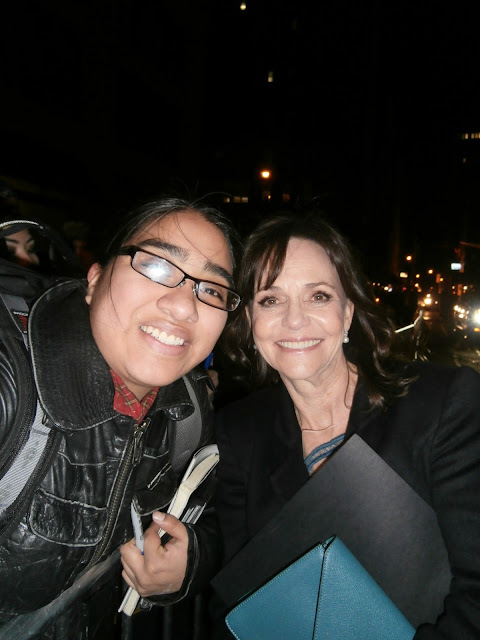 I don't need her autograph or a pictures as I've gotten a few at the stage door of The Heiress so I stay back. She signs for everyone, one each. And she or her publicist remembers each person, calling out those who try to get multiples. It makes the process fast and she's done quickly and heads inside. She is, after all, about to receive an award! We head out to grab some food while the awards ceremony is going on. I follow the live tweets (thank you, journalists!) and we head back as soon as they begin the award for Best actor given to Daniel Day Lewis by his Lincoln director, Steven Spielberg. We decide to wait by the side door, expecting DDL and Spielberg to leave that way after the show is done. We find out McConaughey, Rock and a few others have already left. Emmanuelle Riva leaves while we wait. The show ends and people start filing out. I manage to get James Gandolfini on my Zero Dark Thirty one sheet (it's already signed by Bigelow and Chastain, more on that later). While heading back to wait by the side door I notice Sally Field is leaving. I quickly run over and she's kind enough to stop again, this time for a photo! She signs for a few others and leaves. I head back over as I see Rachel Weisz car pull up. And out walks both Rachel and my favourite, her husband, Daniel Craig. They don't stop but I never expect the to. Haha! I head over to the other side door, on the opposite side as where everyone else waits. On the other side, Michael Shannon has left and is swamped by people and he nicely stops and signs and take pictures. He's awesome but again, I got him a few times at the stage door of Grace so I stay out as I see that DDL and Spielberg are there, chatting with Chastain. Bigelow is there too and not too long after, Chastain and Bigelow leave. DDL and Spielberg end up sneaking out the opposite door. Thus ends the evening. I'm happy with who I got, Sally Field being the highlight! Follow me on Twitter at @Corellianjedi2 for more adventures!